This week's topic from The Broke and the Bookish is: Top Ten Authors New to You in 2014. I couldn't narrow it down to just 10! Once I whittled my list down to 14, I thought, "Ah! How appropriate!" 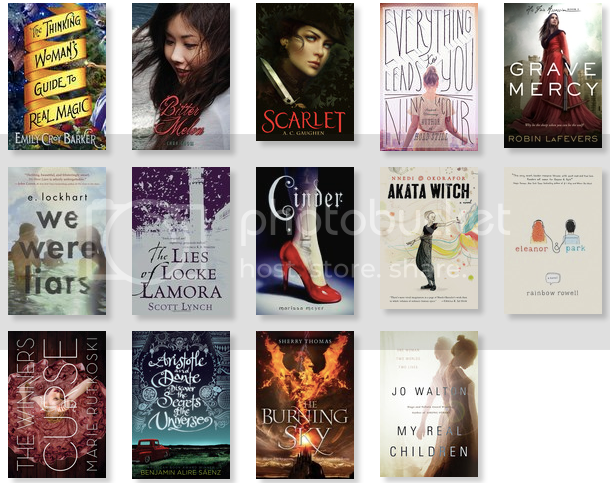 So, here is my list of the top 14 new to me authors for the year. Emily Croy Barker - I must read more by this author! I loved The Thinking Woman's Guide to Real Magic. Cara Chow - I loved Bitter Melon. It was hard to read at times, but you could tell it really came from the heart. Write more books, Cara Chow, and I will read them! A.C. Gaughen - I already have the rest of her books sitting on my nightstand. Robin LaFevers - Ah, Grave Mercy was loooong, but it was worth it. E. Lockhart - I love surprise endings and was blown away by We Were Liars. I definitely have my eye on this author. Scott Lynch - Amazing! Gentleman Bastards is the most amazing medieval mafia thief vs. magician's guild type story I have ever, ever read. If you haven't heard his guest appearance on the Writing Excuses podcast yet, you should definitely give it a listen to get a sense of what a rascal he is. Marissa Meyer - Cinder was much lighter and more fun than I expected. What a fun world she's created. Nnedi Okarafor - A totally unique voice, her books belong in every library. Rainbow Rowell - Like everyone else, I am ready to hop on board with this relatively new YA sensation. Marie Rutkowski - I like her world building. Benjamin Alire Saenz - Wow, who says guys can't be sensitive? Sherry Thomas - There will never be another Harry Potter, but I can always comfort myself by reading awesome magic boarding school stories. Jo Walton - I love timey-wimey stuff, and her book My Real Children left things just open-ended enough that readers won't know which alternate timeline to root for.